We did everything possible today to get a good result in the RANSA Winter Wednesday. Every surplus sail was removed from the yacht and left in the Greenwich Flying Squadron clubhouse for the afternoon. We set the larger of our two radial cut carbon genoas and pre race adjusted sheet cars to the best position for light air beating. Even the crew bags were moved to the forward cabin to get the bow down and the fat stern out of the water. Due to the lack of wind the race was postponed and during this period we lost track of the start time. Agrovation was kind enough to call down the time so we could restart our watches and in return we let them into the line at the start boat but not Amanti who was too high on the line. Allegro started well a few boats widths to leeward so we were able to pull well below Agrovation and work into clear air. The boat end was the right place to start and once in front of Agrovation we had only Allegro to leeward and ahead to contend with. For a long time we made very small gains and were working above the line of the mark so we pulled away a little and were surprised that Allegro started to pull away again. As the breeze headed we were back working and lifting above Allegro again and this time we broke through to have a clear ahead position going into the top mark. The leeward end of the line starters were punished by this late shift and never got up to the line of the mark. We had eyes for no other boats at this stage as Allegro was only a few boat lengths behind and doing just as well on the broad reach. I worked up to Allegro’s line even though we did not want to go too close to Steele Point just to have the same breeze and that worked for a while until we reached Steele Point and Allego went where we would not dare to go. For a while their momentum kept them moving ahead while we slowed to leeward but once into the wind shadow they stopped and as the wind came over the hill we restarted sooner and were able to lift up into a clear ahead position aiming for the finishing boat at the Rose Bay mark. We did get the gun for the first time this season and were pretty pleased with our effort. The extra 4 m2 in the larger genoa seemed to help to windward. The foot sweeps the deck more closely that the smaller one and that might contribute to the windward performance. It was our breeze with the wind rarely getting above 7 knots and at that we were close to our heel angle. Joli had been close behind Allegro reaching back to Steele Point but seemed to get caught in the wind shadow and slipped a little further back but still close enough to take 3rd place despite her large handicap. Agrovation had the best start of the day at the boat and hung on for a fifth place on handicap. We did take the handicap honours from Allegro and Joli but by my calculations these were No 2 and No 1 on the handicap leader board and our 1 and 2 points gains respectively not enough. Larrikin was not in the fleet today which just proves there is a reward for attendance. And what a reward it was with the rain holding off until the sails were packed away for the day and the race committee shortening the course at the appropriate time. Despite the cold weather we are experiencing the sunny windless days are perfect for maintenance work on Passion X. Several weeks ago we were embarrassed when as port tacking yacht we could not find a gap between the starboard running yachts. Now if it was the world championships or even the last day of a regatta we could understand a hole not opening up for us but one did not and we hit a friend and damaged the overhang on the sugar scoop transom on Passion X. I promptly glued up the damage and while it was coated with plenty of epoxy it still needed a final capping piece to complete the work. Saturday was a perfect day for the task and I fabricated a capping piece from 12 mm hardwood plywood using the old shattered capping piece as a template. it worked a treat and the new piece was splice joined into the good section out on the water. Today was the only time I had to do some final filling and fairing as I have a busy week ahead. The longest part of the process was sanding off the two pack polyurethane resin from the areas adjacent to the work so that the new epoxy coating would stick properly. Tonight is is all done and with the surplus two pack epoxy I tidied up some of the nicks in the transom from the storm damage at Port Stephens back in April. The nicks had been filled with epoxy filler but it was discolouring with age and needed tidying up. The job is not finished as the epoxy needs more filling and fairing but for now it is all white and water tight. I took the opportunity to remove some surplus tools from Passion X which will be of benefit in the coming week as the forecast for Wednesday looks pretty light. We started right on the line on time today and were rewarded with clear air to establish a lead on our favourite reaching leg. The pin end was biased and there were so many yachts vying for the pin that I expressed the opinion to the crew that we were best off being the most windward of the leeward yachts. That way we would have first use of any breeze coming across the fleet. The crew agreed and we executed well. On the reach we used a sheet run to the rail to minimise the twist in the old faithful carbon genoa and took advantage of the gust to run away just like Hitchhike did last week. Clear air must be a great assist as this week we had the clear air on Hitchhike and they did not catch us. At one stage on the reach the wind speed hit 21.1 knots and we hit over 9 knots of boat speed arriving at the mark with enough time for a tidy rounding for the work back to Rose bay. Working is our weak point but we pulled on the back stay tight and settled in for the long slog. At first our line was taking us above the mark we have to stay inside but the breeze headed which took us right back into the Div 2 fleet coming in on starboard tack. The fleet was so dense we could not thread through. We also had to tack to clear the mark but this left us on port pinned in by the Div 2 boats and the following Div 1 boats. 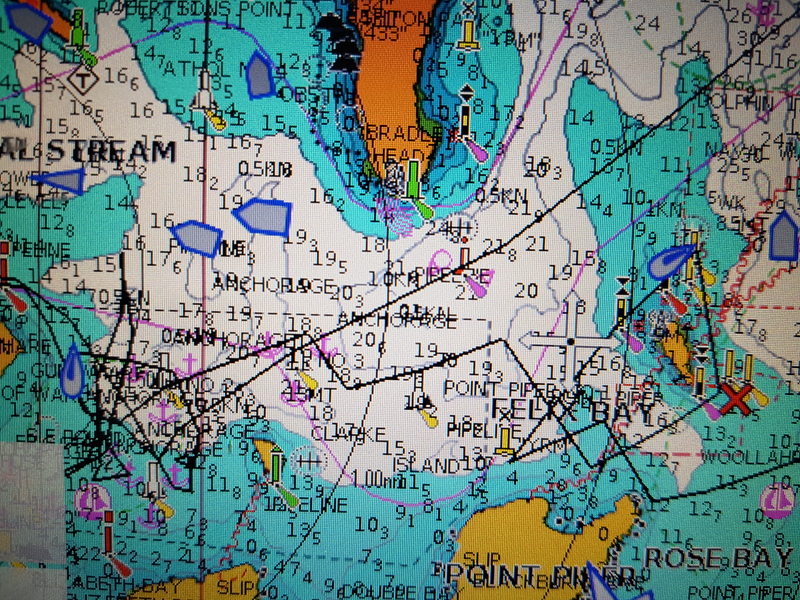 We were now the most windward yacht and already suffering from disturbed air off the shore but we were further out than last time and held the course all the way to Steele Poin. We hung on in header waiting for a line to clear the point but by the time we tacked the we were now being headed on starboard tack and had dropped into the dirty air of Amante and Arunga. Working into Rose Bay we got a little back with a lift along the shore but not enough to clear the Rose Bay mark. Once around the mark we were back on a reach and able to put distance between us and Enigma the Div 2 yacht that was making life difficult. Into Point Piper we made up ground but not enough. 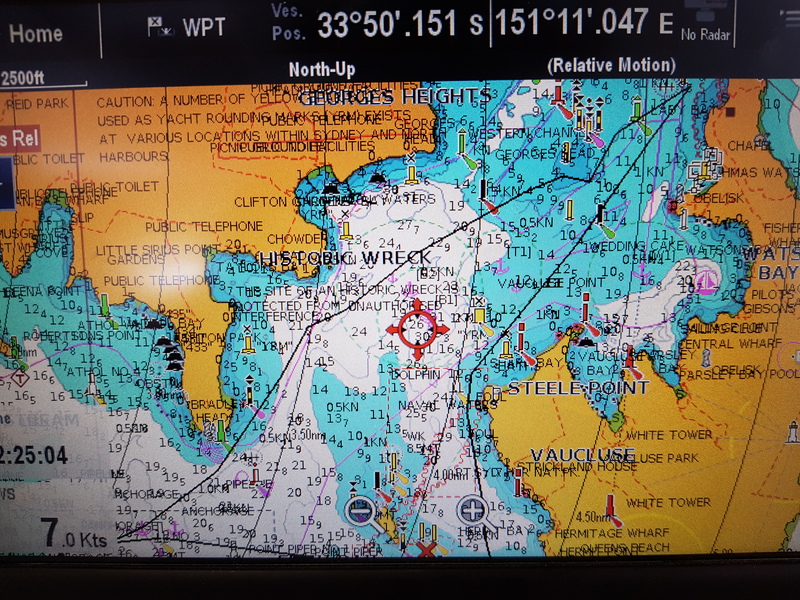 The run down to round Shark Island was spend looking over the shoulder at Allegro and while we did play the shifts on the work around Shark Island she was quick enough to draw alongside at the mark. Fortunately we were now reaching to the naval buoys and on our favoured angle so we held off Allegro. We were pleased with this result as both yachts had had a bottom scrub by Harbour Dive Services within an hour of the race start. i did not get a close look at Amante’s underside but judging by her performance I guess it was cleaner than it has been. Hanni was the surprise performer with a fastest time from Amante and the casual entry the J112e Urunga. That left us fourth fastest on the day but it was not enough to do well on handicap. The large fleet of 19 yachts that enjoyed the conditions had plenty of good performances including a second from Larrikin who is zooming up the leader board with a 3,2,2 in the last three races. Joli struggled with just 3 on board but on my calculations after the first drop they will be at the top of the board from Allegro and Hitchhike. Our eighth was enough to take us up to fourth as soon as the first drop is applied. For the day we reached well but did not pick a good windward path through the fleet and the wind shifts. Also on one crash tack I had the windward genoa sheet wrapped around my ankle which was very slow. Just an average day at picking wind shifts. 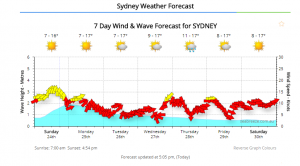 It was a cold gusty westerly today with a forecast for Sydney of 28 knots and 16 degrees so we set our No 3 jib and put in one reef in the main. With the one reef in the head of the sail passes below the running backstays and makes tacking and gybing comfortable on board. We made a good start at the boat end with clear air only because we could not get down to the pin. As it happened we cleared the boat with just few centimetres to spare and tried to stay above the fleet. We looked good until the breeze headed and the pin end starters came across on a lift and easily crossed ahead. We stayed out of trouble tacking to port well below the yacht caught below the prohibited area marks so as to give everyone the maximum manouvering room in the windy conditions and were rewarded with a lift along the shore. The reach from Spectacle to Schnapper Island was spend setting up the code 0 for the long broad reach back to long nose. It was the right sail for the leg but we had the furled sail crossing the leech of the jib which prevented it from unfurling. It is surprising how little resistance is needed to stop the furler turning and we learnt this with quite a bit of time lost. Once set we were holding out the Sydney 38, Avalon but lost out on the gybe to go to Goat Island when did not have the code zero ready to gybe. As it was very windy at this stage and gusting to 28 knots we elected to continue with jib and reefed main alone while Avalon and the Adams Xs in the fleet went with full mainsails. 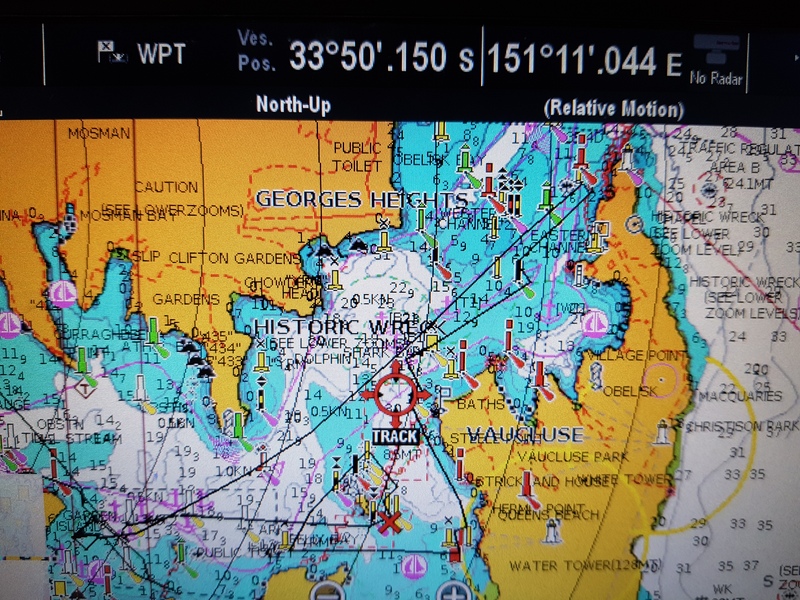 It was a long hard work back from Goat Island to Spectacle Island and having been discouraged by our problems with the furler we elected not to fly the Code 0 again. In retrospect we should have persevered as it seem the furler line had been caught around a fairlead and we do need the practice. Had we been able to resolve these issues we could have carried the Code 0 on six of the legs of the course. Avalon ended up eight minutes in front which is about the usual time that Blue Chip, another Sydney 38 would finish in front in last years RANSA Winter Wednesday series in similar conditions. Full marks to them for carrying the full main around the course. Irukandji did well as she likes the hard beating in a breeze and she carried her assymetric spinnaker so well that we did not see her after the first leg. We did hold out two of the Adams X who carried full mains and the Sydney 36, Another Planet. For the first lap when it was stronger we held out the Fareast28, Wilding2, and had a box seat to her thrills of carrying the Assymetric down the reach from Spectacle to Schnapper Island without gaining on us but once she hit the broad reach she took off on a plane and in one gust pulled away four minutes on us. Full marks to those who carried assymetric spinnaker and or carried full mainsails around a challenging course. For our part we need to practice the code 0 setting more and see if we can avoid tangles in the lines. I should mention that the first yacht to finish was Skeeter, the Bethwaite 8, which was out of sight of most of the fleet all day. In these conditions where they can get up and plane while the displacement hulls are bogged down they have a distinct advantage. We did hit 10.2 knots in one gust but they were 17 minutes in front and did not do their handicap any favours. Overnight I watched the replay of the Volvo Ocean race last in port race and saw Team Brunel having the same furler problems which prevented them deploying the larger masthead reaching sail. They had similar issues with friction between the existing sail and the new one so now I don’t feel so bad. Passion X with the reefed fat head main and small jib heeling in the strong westerly. Wednesday at RANSA provided the close racing we like but so sorely missed last year when we were misplaced into DIV 1s. 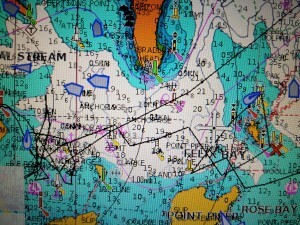 As expected we are quite competitive downwind but less so upwind. The sometimes gains downwind are insufficient to make up for the frequent losses upwind but we are competitive enough to stay with the leaders if we play the wind shifts well or get lucky. Last week we played the wind shifts almost to perfection but still managed only 4th on handicap as others further back in the fleet also played them well. This week we played the shifts quite well and made up some lost ground when we took the right hand side of the course on the beat back to the finish line. And while we finished close behind the J112e twins we still managed only 4th on handicap. We know we played the shifts well from Shark Island as we were crossing tacks with Blue Chip from Div 1s who was on the earlier lap for that division. The start was fair as we were concerned that someone might try a starboard hand start so we ended up to leeward of Allegro, Foreign Affairs and one of the J112e yachts. The arrival of a second J112e in the fleet had us mightily confused all day and we await an obvious name on the new arrival so we can distinguish her from Joli. Hitchhike was to leeward in clear air while we had dirty air from Allegro whenever the wind went aft. I tried to run down in the puffs but the fleet above kept getting them first and pushing ahead so that we were also in dirty air when the breeze went forward. Eventually I worked all the way down to the line of Hitchhike who was also running away with the gusts and building up a good lead. The beat back to Steele Point was tight but not so tight as to need a tack. At first we were slow and did not get competitive until we had the back stay on very tight and flattened the top of the main. With that done we were almost matching Amante, Joli and the casual entry Arunga, the second J112e. The all passed us around Steele Point but on the work to Point Piper we were able to take the windward side and retake Amante. Every time we went off the breeze the fast reaching Fidelis would loom up behind and she hung on well to windward to finish not far behind. The last work to the finish was when we took the windward side of the course both for clear air and to keep in phase with the shifts. Here we caught Arunga and made up ground on Joli but not enough. Arunga timed the tack back to the finish well forcing us to tack to leeward a little tight of the mark so they slipped away in front. Looking back in the fleet we could see Larrikin doing well for the second week and it was no surprise that Hitchhike, Larrikin and Allegro finished ahead on handicap. Foreign Affairs, Hitchhike, Joli, Arunga, Allegro, Crosshaven, Passion, Amante and Fidelis. We take some satisfaction on being handicapped harder than Amante but we will see what happens when they have a clean bottom. Yes it was wet and no amount of glass half full thinking can change the fact the sailing gear is still dripping water onto the floor of our sun room. Inside Passion X the soaking wet No 1.5 genoa is dripping water into the other wise bone dry bilge. Yes we set the No 1.5 black genoa which is the old faithful off Passion. Pre race we practiced letting the boom sit on the boom vang strut so that the wind could flow freely off the main. We proved we could do it but in the excitement of the race did not put it into practice. At the leeward end of the line we started on time and soon had our nose in front of all the fleet. Clear air and a heading breeze can make any yacht look quick but we were also on our favoured angle . As the breeze headed it became a work which had us worried. When the breeze sprang up we flattened the main aggressively and seemed to hold the fleet. 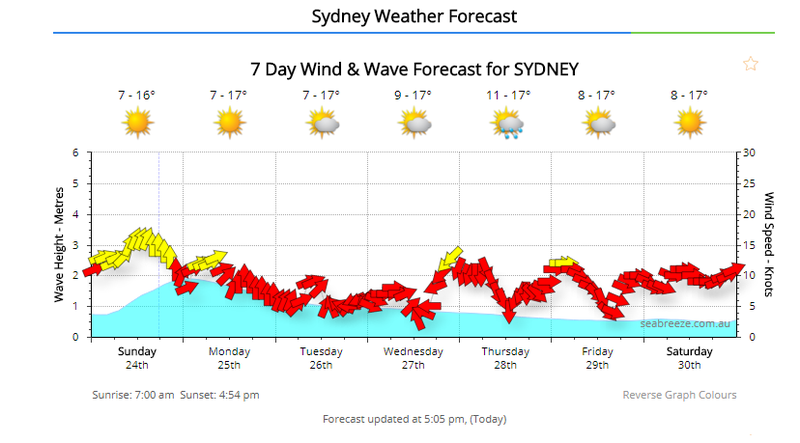 A long board on starboard put us in the ideal position to flip to port when a massive header with fresher winds hit. Now we could cover the fleet and get back south for the next header. I would have taken a photo of the tracks but it was so straight a line it did not look like a tack. Our first to the top mark was satisfying considering the amount of hard on the wind work but the breeze started to die. In the light breeze we were passed to leeward by Joli and this is where we should have tried the boom down on the vang but occasional puff kept us waiting for the breeze to return. Around Steel Point the breeze lifted taking us rapidly towards the short course finish in Rose Bay. 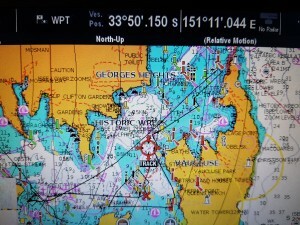 Now it was our turn for a bit of adverse winds as the breeze died and headed leaving us well short of the mark. As Joli took the gun our time was extended by light breeze from the wrong direction. Mercifully we crossed the line next as the fleet came back with freshening breeze. As we crossed the line I could see Agrovation in close company of Amanti and obviously having a blinder of a race. Also Larrikin was well up and I speculated she would do well. All my speculation proved correct as Agrovation won from Joli and Larrikin with Passion X in 4th place. We did enjoy the result despite the rain and did enjoy the photo that DJ put up on the Greenwich Flying Squadron facebook page. It was a good GFS day with three of our yachts in the top four in Div 1 and Hasta La Vista second in Div 2. As and update I took a photo of the tracks before I erased them before the next race and can now show how well we took advantage of the big wind change. Love it. Sailing in almost the same directions on opposite tacks. Last Sunday was the third race of the West Harbour Winter series and an enjoyable change of course. 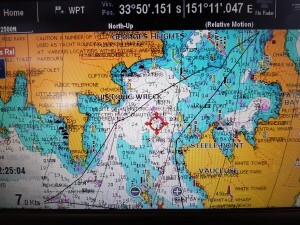 For the first time we were sent out around Shark Island and back around Goat. The course produced a good range of tight beating and close reaching with only one spinnaker possible leg from south of Goat Island to Long Nose. All the excitement of the start was experienced in high definition as Boxer bore away to run down the line oblivious of our position to leeward. Only loud shouting woke them in time for a late bear away behind our stern. This was a truly frightening experience and the thought of a full speed Adams X crashing into the midships of a stationary Passion X does not bear contemplation. We struggled off the leeward end of the line due to a late header which allowed the higher yachts to run over the top. Pinching hard is not our strong point and we had to wait till we cleared Balls Head to bear away and make up ground. We did well on the broader reach to pass Irukandji only to have them power over the top of us when we went hard on wind around Shark Island. We tried but were not to catch them again. On the broad reach back from Goat we flew the code 0 outside the No 3 jib and did quite well except for the well sailed lightweight yachts with asymmetric kites on poles. We finished mid fleet on handicap still wondering how to go faster to windward. it was a most pleasant afternoon with an above expectation supply of breeze on a new and interesting course. A big thank you to the starters.